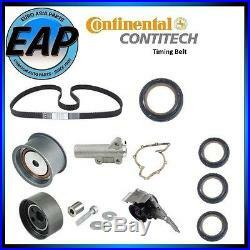 Complete Timing Kit With Water Pump, Cam Seals, Crank Seal. TB297- 07854028259 -OEM Continental Timing Belt. 078109244H - 07954043 OE Aftermarket Timing Belt Idler Roller. 078109479E-07954052 - OE Aftermarket Timing Belt Tensioner. 078109243S - 07954040- OE Aftermarket Timing Belt Tensioner Roller. 078121004RIT - 11254024- OE Aftermarket Metal Impellar Water Pump with Gasket. 038103085E - 22554051 - OEM Front Crank Seal. (X3) 038103085C - (X3) 22554050- (X3) OEM Cam Seals. INTERCHANGE (Vehicles this part fits). Audi A6 Quattro 1999 2.7L 2000 2.7L 2001 2.7L 2002 2.7L 2003 2.7L 2004 2.7L Audi Allroad Quattro 2001 2002 2003 V6 2004 V6 2005 V6. Audi S4 2000 2001 2002. PLEASE READ BELOW BEFORE PURCHASING! The item "For Audi A6 Allroad Quattro S4 2.7L V6 Timing Belt Water Pump Seal Kit NEW" is in sale since Wednesday, June 26, 2013. This item is in the category "eBay Motors\Parts & Accessories\Car & Truck Parts\Engines & Components\Timing Components". The seller is "euroasiaparts" and is located in Sacramento, California. This item can be shipped to United States, to Canada, to United Kingdom, DK, RO, SK, BG, CZ, FI, HU, LV, LT, MT, EE, to Australia, GR, PT, CY, SI, to Japan, SE, KR, to Taiwan, ZA, TH, to Belgium, to France, to Hong Kong, to Ireland, to Netherlands, PL, to Spain, to Italy, to Germany, to Austria, RU, IL, to Mexico, to New Zealand, PH, SG, to Switzerland, NO, SA, UA, AE, QA, KW, BH, HR, MY, BR, CL, CO, CR, DO, PA, TT, GT, SV, HN, JM.